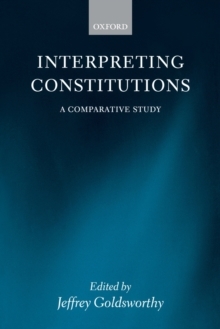 This book describes the constitutions of six major federations and how they have been interpreted by their highest courts, compares the interpretive methods and underlying principles that have guided the courts, and explores the reasons for major differences between these methods and principles. Among the interpretive methods discussed are textualism, purposivism, structuralism and originalism. Each of the six federations is the subject of a separate chapter written by a leading authority in the field: Jeffrey Goldsworthy (Australia), Peter Hogg (Canada), Donald Kommers (Germany), S.P. Sathe (India), Heinz Klug (South Africa), and Mark Tushnet (United States). Each chapter describes not only the interpretive methodology currently used by the courts, but the evolution of thatmethodology since the constitution was first enacted. The book also includes a concluding chapter which compares these methodologies, and attempts to explain variations by reference to different social, historical, institutional and political circumstances.